The first Maricopa student chosen in the 40 round draft was taken by the Pittsburgh Pirates. The team selected Chris Plitt, a right-handed pitcher from South Mountain Community College (SMCC). With their professional season well under way, Major League Baseball (MLB) ran its annual first-year player draft. In this draft, all 30 MLB teams participate and choose from more then 1,200 amateur players nationally. The first Maricopa student chosen in the 40 round draft was taken by the Pittsburgh Pirates. 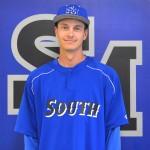 The team selected Chris Plitt, a right-handed pitcher from South Mountain Community College (SMCC). Plitt helped lead the SMCC Cougars to the 2014 Region Championship, earning 2nd Team All-Conference and All Region honors. He posted a 1.87 ERA with a 7-1 record as a freshman. In all, seven current or former Maricopa Community Colleges players were selected from 1,215 total amateurs in the 2015 first-year player draft. See more 2015 AZ draft results coverage. Jacob McDavid, RHP, 6’5”/195 lbs. Tyler Carvalho, RHP, 5’11”/160 lbs. Noel Rodriguez, RHP, 6’3”/190 lbs. David Walker, 2B, 5’9”/180 lbs. Zach Taylor, C, 6’1”/220 lbs. Chris Plitt, RHP, 6’4”/170 lbs. Colton Frabasilio, OF, 6’2”/205 lbs. workforce solutions and education for students and employees in virtually every industry sector.